Beginning in the 18th century, Japanese farm women, during seasonal cold periods in Northern Japan, used a home loom to weave scraps of old fabrics into sakiori textiles. These hardy women would turn their woven lengths of rather narrow sakiori weavings (5 ~ 14 inches wide) into utilitarian household textiles like rugs, kotatsu (heated table) covers and practical garments like warm work jackets, vests and informal kimono obi. Although indigo was the most common color, often these domestically made sakiori textiles, especially the obi and rugs, included very colorful designs because of mixing into the weave random varieties of old brightly dyed fabrics that had been specifically set aside for making sakiori. 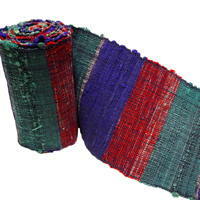 The Japanese word sakiori comes from "saki," which means to tear or rip up, and "ori," which means weave. 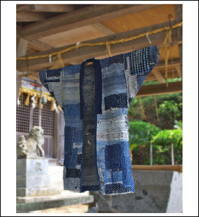 "Saki" relates to preparing the fabric by striping it into pieces and "ori" refers to weaving it together. 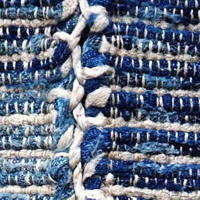 The process is the same as in American & European rag weaving. With Japanese sakiori, torn cloth pieces are rolled into 13 to 16 inch lengths and loomed together in weft (width) rows and using cotton or hemp (rare) as the warp yarn. (length). 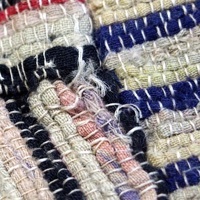 Recycling such old fabric remnants into sakiori weavings follows the Japanese indispensable concept of “mottainai” or not wasting precious cloth whenone can prolong the fabric’s useful life through recycling and reuse. From time to time, we present very unusual, difficult to find, late 1800s to early 1900s Japanese fishermen, fireman's and field workers' sakiori jackets and vests, most oftern possessing extensive sashiko stitching as well.